Project resource scheduling is an important part of writing a project plan for the simple reason that if you don't have the resources available to complete the work required, you will find it impossible to meet your milestones and deliver what is required. 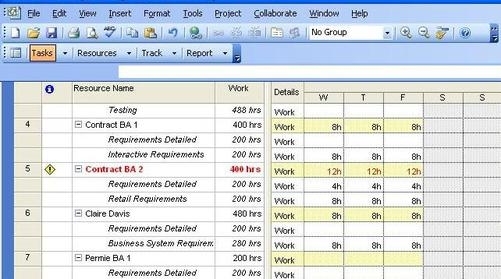 When you have completed your project resource planning, you need to check that you haven't assigned the same resource to completely different tasks at the sametime, as is demonstrated in the example below. Check with the resource whether it is possible to complete the various tasks at the sametime. In some instances say, certain stages of software testing this is possible. The important thing is that you aren't in a position where critical deadlines are looming and due to incomplete project resource scheduling you didn't know that you had over-allocated a resource, because this really is a faux pas which demonstrates inexperience. It is particularly important that once you have done your project resource schedule and know what dates you are going to need resources to deliver certain tasks to, that your project communications management kicks into gear, and you communicate these to the relevant project management stakeholders so that they can allocate the resource required to your project. 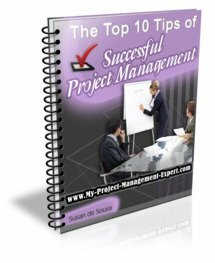 Remember that proactive project resource management is one of the keys to successful project teams. So don't overlook this task. You may be surprised to hear this, but in many companies key individuals are single points of failure. By this I mean that only they know how to either operate system or test it. Therefore since many projects will be vying for their time the earlier you get your request in the better. One thing to remember is that even if you get allocated the resources you require, there is still no guarantee you will get them when you need them. The reason for this is because in all Organisations, Live or Production Issues take prioriy and must be fixed / tested before any project work. If you find yourself in the position of having to request additional resource do not assume this will be cheaper permanent resource. In most Organisations, contractors are used for any work over and above BAU (Business as Usual). This may mean that you get the work done, but at what cost to the project? Therefore remember to include some contingency with regard to project budget when estimating project costs.